A Weekend In Washington, D.C.
Jeff and I headed to Washington D.C. this past weekend to celebrate the marriage of his Peace Corps buddy Billy Delancey to his beautiful bride Callie. Jeff and Billy met for the first time on their plane ride to Vanuatu. This weekend was the first time they'd seen one another since our own wedding in 2013 where we met Callie for the first time; she and Billy had just started dating. Their wedding was one for the record books taking place in the Georgetown neighborhood at the church where Callie was baptized. At the Dumbarton House in Georgetown, the venue for the DeLancey wedding reception. The entire event was very romantic, carefully designed and completely lovely. Their reception was held at the Dumbarton House - a close 6 block walk (lead by a bagpiper) from the church. The processional was followed by a cocktail hour complete with plated appetizers and specialty peach cocktails. Dinner was delicious, dessert (amazing cupcakes from Baked and Wired) was superb and out side of the rain, the evening was perfect. A big congratulations to Billy and Callie on their newest adventure of marriage! Additionally and in true Kladder form, while we were in town we took full advantage of our trip to explore the city. While Jeff had previously visited Washington D.C. on two other trips, it was my first. And despite the cruddy weather on Saturday, we could not have asked for a more beautiful day on Friday - 75 degrees and sunny. 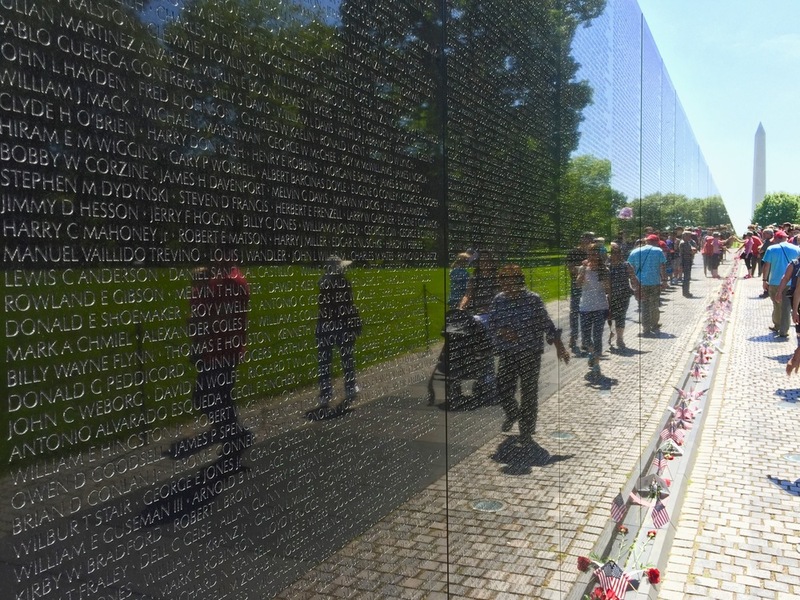 Our walk along the Mall included the Lincoln Memorial, the Washington Monument, the Vietnam Memorial, and the Korean War Memorial - all within walking distance of one another and all completely free (a.k.a. paid for by your tax dollars). After an hour spent walking along the Mall we made a stop at the White House. We applied for tour tickets a few months back but were unfortunately declined (apparently a tough ticket to get these days) so we viewed the property from outside the gates. It was neat to see even from the outside. Afterwards we started towards the Capitol Building for our 1pm tour time. Also an application process - tours can be made HERE. Outside the White House in Washington, D.C.
On the way we made a pit stop at a chain of food trucks for a quick bite which were surprisingly difficult to find outside of the many carnival-food-like trucks (hot dogs, pretzels, pizza slices) that seemed to be stationed everywhere. We assumed there must be some sort of contract in place for the identical trucks scattered throughout the tourist heavy locations. The ones we stumbled upon were a bit off the beaten path and offered better options like tacos and gyros. The Capitol Building currently under construction. The Capitol Building tour was fabulous! It began with a 13 minute video that was cheesy but very informational followed by approximately 45 mins worth of walking and listening through headphones to our tour guide who was the most knowledgeable history buff I've ever met. He also made lots of 'dad jokes' which I appreciated. The tour was free and we totally recommend it. Later we jumped back on the Metro (which is the best way to travel in D.C. - easy to use, quick and very affordable - $14.50 a person for a full day pass) with a destination of the Pentagon. First impressions were that it's massive - it's listed as one of the largest office buildings in the world housing more than 26,000 employees. Coming from a small town girl who hails from a place with a population of less than 2,000 people, that's incredible. Our stop here also included a visit to the 9-11 Memorial accessible by a quick 10 minute walk from the Metro station. On the left, the 9-11 Memorial and on the right, the Pentagon. Our last stop on Friday was our visit to the Arlington Cemetery. This was also free and another 10 minute walk from the Metro station. Here we saw JFK's burial site and the breath taking rows of uniform headstones honoring our nations fallen soldiers. The property was large and had we more time (and energy left in our feet) we would have make the additional stop to see the Tomb of the Unknown Soldier. Our tourist-ing that day was followed by date night at Urbana. The food was wonderful and the atmosphere was comfortable. After dinner we joined the wedding party for cocktail hour - a busy day followed by relaxing fun. The Museum of Natural History in Washington, D.C. The following morning we took advantage of the many indoor attractions offered by the Smithsonian including The Natural History Museum (my favorite), The American History Museum and the National Archives. It was incredible to see the Declaration of Independence which was surprisingly, extremely faded. We asked the attendant on staff how long it would take for the writing to completely disappear and he said within 100 years. He also said that within that time span they will remove it from display in hopes that keeping it from the daylight will save it long enough for technology to be developed that will restore it for the future. In short, if you want to see the DoI, you better go soon. And as always, the museums were completely free for entry. Take the Metro - It's the easiest and cheapest way to get around in the city! If not the Metro, D.C. has Uber and is a WAY better option than to cab it. We took all three and in this order we recommend use: Metro, Uber, Taxi. Lodging - We booked a hotel close to the airport for convenience on flying in and out of the city for our quick weekend trip. We hunted for AirBnBs but all within the central city were just as expensive as hotels. Also, staying outside of the center saves you big bucks. Everything is FREE! - All government owned attractions are completely free of entry. It's recommended to make your tour times in advance to ensure your entry and to save you time in lines. Wear comfortable shoes - This is not a joke, wear tennis-shoes. Everything is extremely spaced out and we walked more in D.C. than we have in any other city we've visited. I wore gladiator sandals the first day and completely regretted it. I'm still nursing my blisters. Last, I'm introducing a new segment to the blog titled POSTSCRIPT. In my travels and even in day to day life I've discovered that I 'consume' in trends. From books to food, here I'll share my notes on things that are currently keeping my attention. Enjoy! For local readers (and those who are interested in visiting Grand Rapids) we recently signed up to be part of the ArtClub for ArtPrize. Check it out! $60 for two people and lots of perks for during the event and throughout the year.